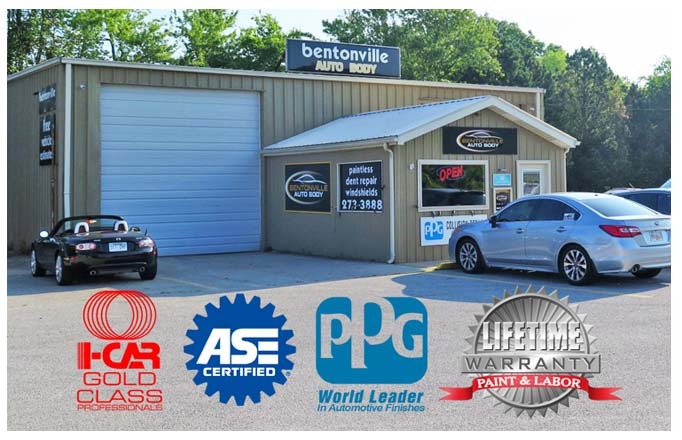 We are a locally owned, family oriented collision repair business that proudly serves all of the Bentonville and Northwest Arkansas communities! We provide all types of auto body and collision services for cars, light trucks, SUV's, commercial rigs, rv's and trailers. At Bentonville Auto Body , we are committed to earning your business by making You, the customer, our priority. We pride ourselves in having quick response times, a very courteous staff, and competitive rates. We provide auto body collision repair and automotive painting services for all makes and models including imports, performed by highly trained, certified technicians. We have great relationships with ALL Insurance providers in our local area yet we will NEVER sign a contract with them, because that limits the control of the repair for you, our CUSTOMER. Voted Best Of Bentonville four years in a row, for Automobile Body and Paint Repair!